A lot of people make resolutions for themselves for the new year – eat better, exercise more, quit smoking and so on and so forth. But what about your home? Have you made any resolutions when it comes to your house and how it looks? If you hadn’t thought of it before, now is definitely the time. Whether it’s clearing out the gutters or even just finally getting rid of the Christmas tree, how your home looks is a reflection of you and where you are in life. And if you’re making some changes in your life and want them reflected throughout, what’s the best and easiest way to do that? Why, with new furniture, of course! New furniture can update your look, make your look do a 180 or anything else you might desire and this new year we’re making it even easier for you to meet your 2013 house resolutions. How is that possible? 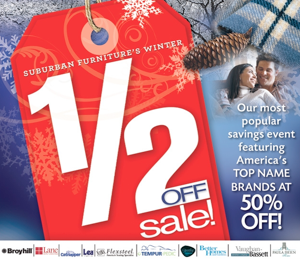 Well, right now is Suburban Furniture’s Winter ½ Off Sale! Our Winter ½ Off Sale is our most popular savings event featuring America’s top name brands at 50% off. Stop by today and transform your life!